Nearly 1 kilometer of walkways and tracks along with centers for visitors were built in Kanlıdivane. Roads with handicap access for people with disabilities were also established. Preparation has begun for the restoration and landscape planning project for the Ancient city of Akkale located in Erdemli district, Mersin, a city known for its olive oil exports. Speaking to reporters in Akkale, the president of the Erdemli Chamber of Commerce and Industry, Orhan Sarı, inaugurated the project, underlining the initiatives being taken for the project and explaining that the landscape planning project will be completed in collaboration with the Culture and Tourism Ministry along with the faculty of Mersin University. 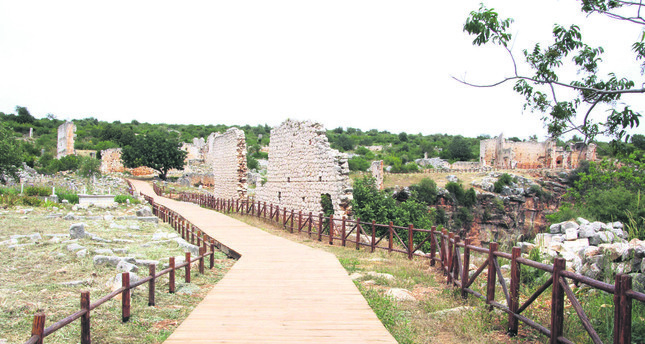 The project is in the preliminary stages and landscape planning is being conducted in the ancient city of Kanlıdivane to then be implemented in Akkale, according to Sarı, who stated that "We want to bring new life to the ruins of the historical and cultural values in Erdemli; namely, the ancient city of Akkale. The Chamber of Commerce will initially prepare a restoration project for Akkale before embarking on a landscape planning project similar to the project in the ancient city of Kanlıdivane. We are ready to do our part to contribute to the revival of the ancient city and prepare it for tourists. We will initiate the project on the matter and submit it to the Culture and Tourism Ministry. If accepted, the ruins of the ancient city of Akkale will be revived." Dr. Ümit Aydınoğlu, an associate professor from the department of archeology at Mersin University, indicated that during his time working as a consultant for the landscape planning project in Kanlıdivane, the project was successful from start to finish,"Nearly 1-kilometer-long walkways, tracks and centers for visitors were built in Kanlıdivane. In addition, roads with handicap access for people with disabilities were established. The ancient city was the most important olive oil production center in the region and we have restored this center, keeping the historical characteristics close to their original form, unearthing the sites where olives were cracked and pressed during ancient times. Aydınoğlu also noted that the preliminary project underway in the ancient city of Akkale is intended to be completed the same way. After the Chamber of Commerce applies to the Culture and Tourism Ministry it will await approval before beginning the project.